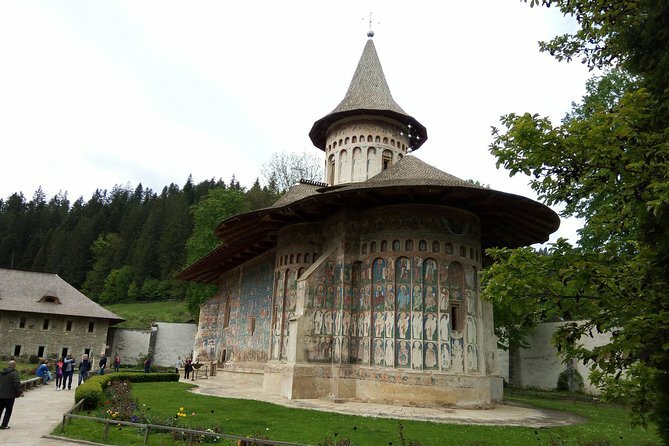 Explore the fascinating land of Painted Monasteries, Bicaz Canyon, Red Lake and Brasov City on this packed 3-days tour from Bucharest, ideal for first-time visitors in Romania.The painted monasteries located in the North-East of the country offer a glimpse into the traditions and history of Bucovina. Admire the amazing Bicaz Gorges and the Red Lake,and last but not least, Brasov City. We start our tour driving from Bucharest to the North, heading to Bucovina region, undoubtedly, one of the most beautiful area of Romania. You will have the chance to admire the Eastern side of Carpathian mountains, country-side landscapes, stopping in Gura Humorului, where we can enjoy a good rest for the next day. Today you will find the Painted Monasteries: Voronet,Moldovita,Sucevita. Deemed masterpieces of Byzantine art, these churches are one-of-a-kind architectural sites in Europe.Perhaps the most famous and stunning of the painted monasteries is Voronet (Vo ro , founded in 1487. Widely known throughout Europe as "the Sistine Chapel of the East" due to its interior and exterior wall paintings, this monastery offers an abundance of frescoes featuring an intense shade of blue commonly known as 'Voronet blue. The composition of the paint continues to remain a mystery even now, more than 500 years after the church was built.The Monastery of Moldovita , located in the village of Vatra Moldovitei, was built by Petru Rares in 1532.The predominantly gold and deep blue paintings on the exterior walls were completed in 1537.High walls and heavily buttressed defensive towers surround the great monastic complex of Sucevita, giving it the appearance of a fortress.Sucevita was a princely residence as well as a fortified monastery. Today, the thick walls shelter a museum presenting an outstanding collection of historical and art objects.Afterwards drive to Piatra Neamt, where you will have accomodation. The 3rd day will get us to the legendary land of Transylvania and its UNESCO World Heritage sites, passing stunning mountain sightseeing, such us Bicaz Canyon or Red Lake - the largest natural mountain lake in Romania.Bicaz Gorge is spectacular with sheer cliffs rising literally from the edges of the road. Legend has it that the ‘red lake’ or ‘killer lake’ was formed from the flowing blood of a group of hapless picnickers who had the misfortune to be sitting beneath the mountainside when it collapsed, crushing them to death. After this we will head to Brasov. Brasov is home to one of the narrowest streets in Europe.The Rope Street (Strada Sforii) is approximately four feet wide.Here you will see Old Town Hall Square,where you can admire colorfully painted and ornately trimmed baroque structures and Black Church (Biserica Neagra), the largest Gothic church in Romania. In the evening you will be back in Bucharest.